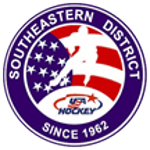 The CAHA Championship Tournaments are the qualifying tournaments to advance teams to the Southeastern District Tier I Tournament and the USA Hockey National Championships. The tournaments are open to all Tier I and Tier II teams in applicable age classifications. Participation in the CHL is not required for Tier II teams. Registration for the tournament has completed. The tournament locations and teams registered are listed below.